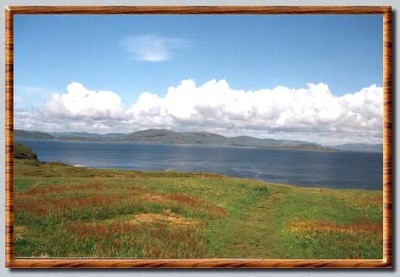 The island of UIva is to be found just off the West coast of Mull. It's only a matter of a few hunderd yards from Mull and can be reached by boarding the ferry at the appropriately named Ulva Ferry !! Ulva is commonly coupled with it's smaller neighbour Gometra which lies off the west coast of the bigger island. The Vikings named the island 'Ullfur', their word for 'Wolf Island' then came ashore and built Glackindaline Castle on Dun Ban, a small rock-ribbed island connected by a causeway to the northwest shore of Ulva. If the Vikings cared to look, they could have found evidence of much earlier inhabitants. The standing stones of Ulva stood then where they stand today, the mute and mysterious legacy of a pre-Celtic, megalithic people who lived on Ulva around 1,500 BC and vanished before the Vikings arrived. The people who set up the stones were, in fact, newcomers compared to the first inhabitants of Livingston's Cave. Archeologists from Edinburgh University have been studying the floor of this large cave. A shell midden, flint artifacts and fragments of bone from lemming, Arctic fox and human infant indicate people lived here from as far back as 5,650BC. 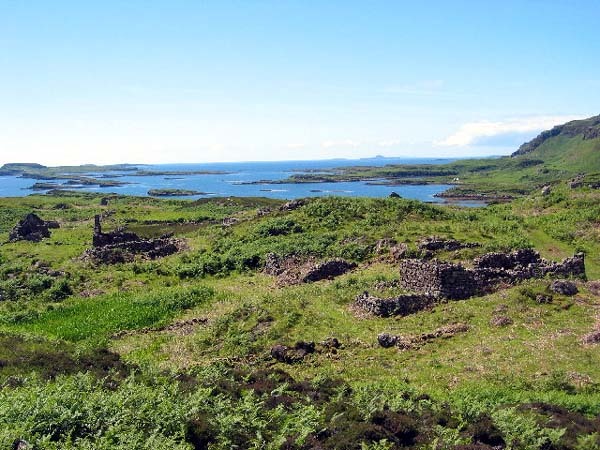 Seaweed plays an important role in the history of Ulva. It was burned to produce kelp, a product in great demand in the early 19th Century for making glass and soap. Being a labour intensive process ( it took 20 tons of seaweed to produce 1 ton of kelp) Ulva's population grew to meet the demands of cutting, carrying and burning enough seaweed for an average output of 23 tons of kelp per year. 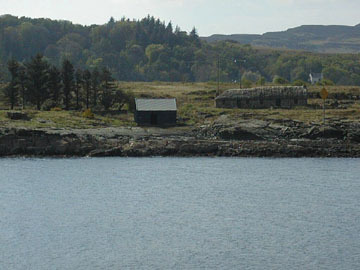 In 1785 Ulva was purchased by a pioneer of the kelp burning industry and his son, Staffa MacDonald ws reputed to have 'trebled his income and doubled his population by careful attention to his kelp shores'. 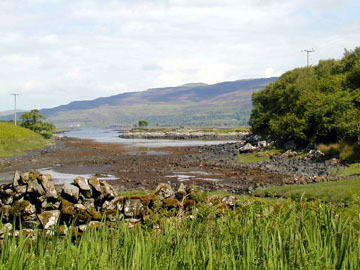 In 1835 Francis William Clark bought Ulva. 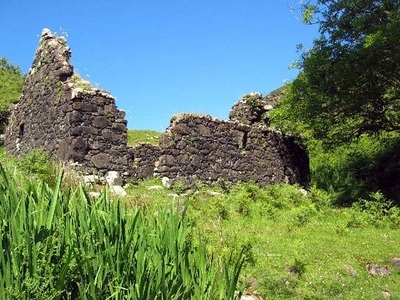 By 1837 the population had grown to 604 people living in sixteen villages whose ruins you can see today. There were shoemakers, square-wrights, boat carpenters, tailors, weavers, blacksmiths, dry-stone masons and two merchants. Clark's high hopes for this thriving community were shattered when the kelp market collapsed and he was left with a great surplus of tenants. Then, the potato blight struck Ulva. Like so many other estates in the West of Scotland, it ceased to be a crofting estate and the sad era of the clearances followed. Some of the crofters who were cleared went to other parts of Scotland, some to north America and Australia. The abandoned villages are sad to see but the saddest is the row of small, low houses which stand at Starvation Terrace on Ardglass point. Here were the last evicted crofters for whom no place could be found. 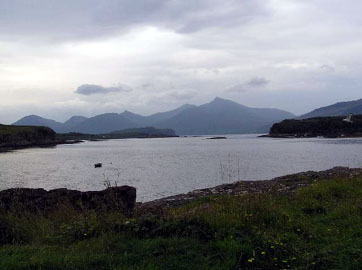 Nowadays Ulva is a privately owned island with a population of around 20 people who are involved in fishing, farming and tourism. Isle Of Ulva - Main point of reference for Ulva on the web. Not a great selection of images but plenty of interesting facts for those planning a visit or just interested in the islands traumatic history. Isle Of Mull - If planning a trip to Ulva then you'll need to know a bit about it's near neighbour Mull. This site contains plenty of local information on the island including what to see, where to stay and how to get there.